Pregnant or lactating women should consult their physician prior to taking any nutritional supplement. Patients taking anti-coagulants or antidepressants should consult their physician prior to taking supplements. HealthyCell daily multivitamin/multimineral complex is formulated to optimize your nutrition and improve your health and quality of life at the level of the cell - the most basic building block of the human body. HealthyCell® includes AM and PM formulas for 24-hour nutrition and absorption boosting nutrients. 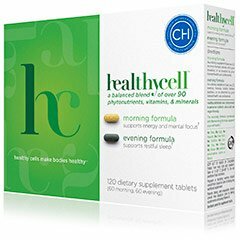 In a national study comparing HealthyCell® to a leading brand of multivitamin, the majority of women and men aged 40 to 60 taking HealthyCell® (two morning tablets and two evening tablets) reported an immediate (within the first week) and sustained (at six weeks) improvement in sleep, energy, mental focus and ability to manage stress. *Results may not be applicable to all demographics and to persons with existing illness. Get your Superior And Most Comprehensive Daily Multivitamin Multimineral Complex TODAY and start noticing a positive difference in your health and life. I have been taking vitamins my whole life. I do believe you need to get most your nutrition through diet but when I was younger I lacked with good nutrition and I needed them. Now I have a great diet rich in fruit and veggies and protein. But my age I need the extra vitamins for optimum health. And what is special about these vitamins is what is in them. And I can feel them. If you can feel your vitamins and you feel great on them. Those are the vitamins to be taking. Read above and see that they have some great ingredients in them. NO wonder I can feel them. I love the fact that you have a morning and night vitamin. Because honestly to get your optimum nutrition you take certain supplements differently during the day. I do because I do intermittent fasting I need them. These are some of the best vitamins I have ever taken. I will be repurchasing them. Also the night vitamin helps with sleep and this is a plus for me!! I give this a beauty 10! Love them!